Antenna engineering is rarely big news, but the problems with the Apple iPhone 4 brought it into the spotlight. It’s highlighted issues that many smaller businesses designing wireless products struggle with. 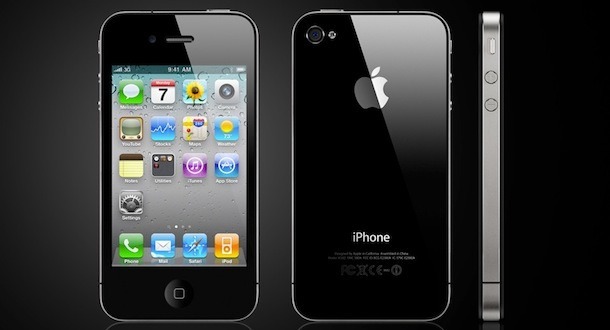 Back in June Apple announced the iPhone 4, in his keynote speech Steve Jobs promoted the new antenna design. I was asked to comment on the antenna for an article on the Wall Street Journal website. The journalist sent me a long list of questions and I replied with a long list of comments. There was only one bit that was quoted directly: “This is a very difficult thing to do”. New ideas in antenna technology are difficult to get right the first time. It’s normal for a new type of antenna to be tried out on a low-volume product first before it is used on a high volume product. Apple decided to skip that step and implement a new type of design on a high volume product, that was a very brave decision. The conventional type of internal antenna for cellphones is the Planar Inverted-F Antenna – the PIFA. The PIFA is normally placed at the top or the bottom of the handset. The PIFA is a flat piece of conductor cut into a shape, it is placed above the handset’s PCB which provides a groundplane. It has a feed pin which connects the RF feed to the PIFA and a ground pin that connects the PIFA to ground. For a PIFA the distance between the groundplane and the antenna strongly affects the impedance bandwidth. The greater the distance the greater the bandwidth that can be achieved. In a handset that distance is directly related to the thickness of the phone. That is the major problem with the PIFA, if more bands are needed then a thicker PIFA is needed, which in turn requires a thicker handset. Modern cellphones must cover five bands to work internationally. The effect this has on the profile of the handset can be clearly seen in the HTC Legend and the Samsung Galaxy SGS, both have a “power bulge” to accomodate the antenna. For Apple though aesthetics and good product design are very important. I think it was this that led to them to adopt radically different antenna technology. They wanted to make a thin five band handset and they got a group of antenna engineers to research the problem until they found an answer. A search through Apple’s patents shows that they’ve been working on this research program for several years. 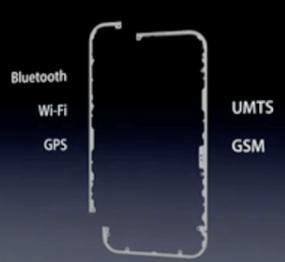 Apple haven’t revealed exactly what sort of antenna they’ve used in the iPhone 4. They have said that the outer frame around the edge of the handset forms the antenna, but they haven’t said exactly how this was done. However, their patent applications are revealing. In this post, I explain how two of Apple’s patent applications suggest that the antenna is a form of slot antenna. As soon as the iPhone 4 was released rumours on the internet began about poor performance. Only a couple of days after it was released there were dozens of videos on YouTube showing the problem. Most of the videos showed something similar, when a hand is put around the phone the signal strength bars fall dramatically. This ignited a lot of debate about the relevance of signal strength bars. Some suggested that the problem was caused by the algorithm displaying the bars and didn’t represent a real issue. (Simon and I were asked to comment in two further articles about that on the WSJ website). While some were blaming software people who had iPhone 4s were doing experiments, videos were recorded showing calls dropping. Then the tech website Anandtech hacked into the software to enable a handset to report the signal strength in dBs. This showed that the fall in signal strength was large: ~20dBm. There are several possible reasons for this, even now it’s hard to be sure. Many people have identified that touching the slot in the bottom left side of the handset causes the degradation. That could have two underlying causes. The antenna could be detuned by the dielectric material in the hand causing electric fields to change. Or it could be that the RF current is being conducted from the antenna into the hand where it is dissipated by the hand’s resistance. It could be a combination of both of these effects too. Without careful measurement it’s difficult to tell this precisely. A problem of this sort can only be completely solved by redesigning the antenna. An antenna redesign can’t be done quickly or easily. Apple decided to give iPhone buyers a free “bumper” case. That case provides a spacing between the user’s hand and the sensitive parts of the antenna, it prevents conduction and reduces. Some users have said that the problem still occurs with the bumper on, though it’s lessened. This is a high profile example of a common sort of problem in handset design. Though few handsets use radical new antenna designs many suffer from performance problems in particular usage scenarios. For example, a sliding handset must work well with the sliding portion extended and retracted. In both of those states it must work well in empty space, close to the head, and in the hand. I’ve worked on many of these handset antenna problems before. If they’re only found late in the project then they can be very difficult to solve. Some projects over-run because of these problems, some switch the antenna type or antenna provider, and some have to be cancelled. Hopefully the iPhone 4 antenna saga will encourage people to take antenna issues more seriously. Perhaps in the future users will be slower to blame poor performance on the network operator and consider the possibility that their handset could be the problem.